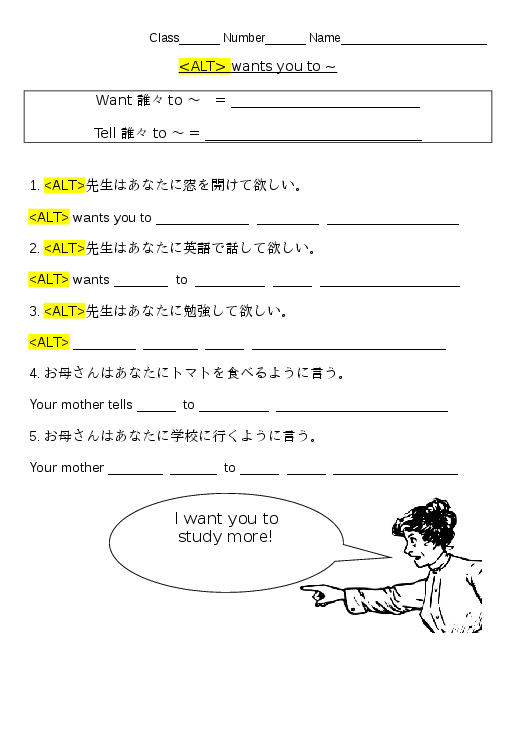 Ask students the meaning of "want you to" and "tell you to" and have them write it down in Japanese in the top box. Then have students go ahead and write out the sentences in English. Before doing this, I introduced the grammar, and then played gossip/Chinese whispers/whispers down the alley/dengon game with the students. I gave the students a message like "I want you to (say YAY!)" The students had to pass the message down their row. The student at the end of the row then had to do the requested action. After playing this for 6 rounds, this worksheet was a good way to get them back into study mode and see if they had actually learned anything.